We love makeup. We love movies. But, does that mean we should combine these two passions and invest in movie-themed makeup? The context for this existential conundrum is this: The limited-edition makeup line for Divergent by Sephora (coming out March 1) landed on our desks, and we were certainly excited about it. (New makeup is new makeup, after all.) And, it's really, really pretty — lots of pinky beige colors and earth tones that we're loving. But, usually our makeup choices center around things like seasonal trends and, you know, our complexions — not the media we're consuming. Just us? This isn't the first time movie-themed makeup has become a thing (far from it, in fact). We were all over CoverGirl's Hunger Games collection — mostly because we find the looks from the Capitol speak directly to our innermost beauty daredevils. Similarly, one of the main reasons we're so excited for Maleficent to come out is that we're anticipating a whole lot of gorgeous beauty goodies to come with it. We're just not sure if the whole concept can be applied to every movie we like. So, readers, we're leaving this one up to you. Do beauty products based on a favorite film appeal to you, or are you meh on movie-themed makeup? 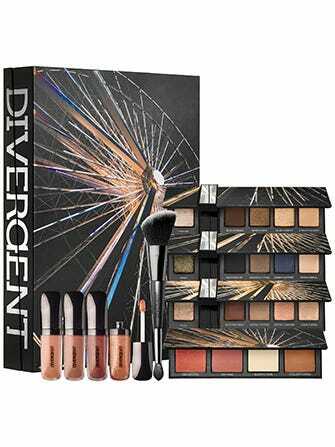 Sephora Divergent Limited Edition Multi-Piece Collector’s Kit, $59, available March 1 at Sephora.